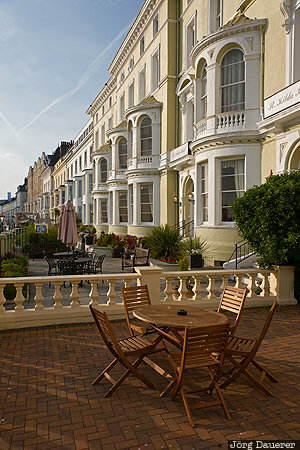 The typical Victorian facades of Llandudno with a table and four chairs in the foreground illuminated by warm morning light. Llandudno is in the north of Wales, United Kingdom. This photo was taken in the morning of a sunny day in June of 2015. This photo was taken with a digital camera.